Pair-a-Sailing is a 2-vs-2 coin-collecting minigame in Mario Party 4. The name is a pun on the sport, Parasailing, hence the name. 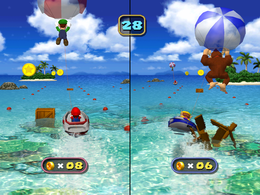 In the mini-game, one member of each team is in a boat, and the other member is in a parasail, flying above the boat. The goal is to collect as many coins as possible. Speeding up the boat cause the player in the parasail to ascend, while slowing down makes them descend. If the player in the boat hits one of the crates floating in the water, they will be stunned for a few seconds, and the parasail will drop to its lowest height. The game ends after 45 seconds, and each member of the team gets the amount of coins they won. Game Rules – "This is a coin-collecting bonus game. Teams cooperate in the boat and parachute to get all the coins they can!" Advice – "Going slower means the parachute will sink lower. The driver of the boat must avoid the obstacles in the water." This page was last edited on January 3, 2019, at 12:00.